A bucket loader came down on the 4-year-old's limbs in October. Four-year-old Adam Mattson of New Vineyard, whose legs were severed in a bucket loader accident on Oct. 23, is getting around in a wheelchair. Physical and occupational therapists are working to help him stand – a few seconds at a time – on his reattached leg. The length he is able to stand should gradually increase. Adam walked beneath the bucket of a bucket loader when his mother’s boyfriend of 14 years, Sam Kennedy, had briefly turned away at a family sand pit. The bucket, which had been down but not resting on the ground, lost hydraulic power and came down on Adam’s legs. “Sam saved his life,” said Kim Mattson, Adam’s mother, who adopted him when he was a baby. Kennedy rushed Adam to the hospital in Farmington, where he was taken by medical helicopter to Boston Children’s Hospital. 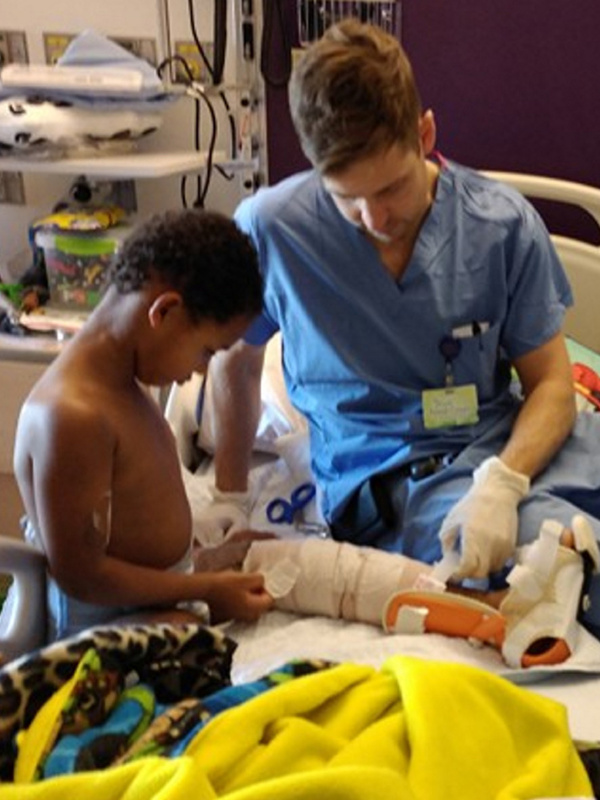 Surgeons were able to reattach Adam’s left leg but were not able to save his right leg, his mother said. Adam has had 14 operations. His last, believed to be the final one, was Dec. 18. They are still waiting to see how well the leg will work, she said. He will get a prosthetic leg on his right side. Adam’s left leg had to go through several washout processes to remove any gravel or other contaminants that could lead to infection during the reattachment process. He has also had several skin grafts. Five medical teams are working with him. Adam has a boot on his ankle and foot. His bandages have been removed. He was allowed out of bed for the first time on Dec. 7. He had to ride in a cart because he needs to keep his leg straight and is now using a wheelchair. He will turn 5 on Jan. 10, and he has known from the beginning that he lost his leg in the accident, she said. “Adam is Adam,” she said. He is physically and mentally strong and is more advanced than a typical 4-year-old, she said. He is in prekindergarten at the W.G. Mallett School in Farmington. One of his doctors told Mattson on Dec. 18 that Adam’s open wound is healing well, she said. The staff at the children’s hospital has made sure that he has had fun during his stay. When he couldn’t get out of bed, they wheeled his bed to where an air hockey game was located so he could play. Adam has also participated in water syringe fights with staff members. He has met members of the Boston Celtics basketball team, created a gingerbread house and played games while there. Adam’s siblings, Kaitlyn Bressette and Mikki Bressette-Konopka, and Kennedy have been constant visitors to the hospital. Mattson’s four other children have visited as often as possible. They came to celebrate an early Christmas with the child. Adam is expected to be moved from the hospital to the Spaulding Rehabilitation Hospital in Charlestown, Massachusetts, by the end of December. A gofundme page has been set up to help the family with costs.